Carbon diamonds have long been produced in the laboratory. Procedures that allow for diamonds to be made from human ashes, however, are still relatively new. 1. The carbon must be chemically and physically separated from the salts contained in the ash. While conducting this process, the salt released combines with the air, which then dissipates. 2. The pure carbon is then compressed in a press at a pressure of 50,000 to 60,000 bars. It is simultaneously exposed to heat, depending on the size of the preferred diamond, between 1,500 and 1,700 degrees Celsius. 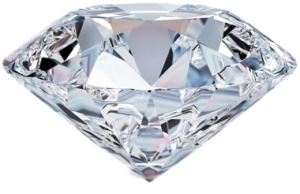 The pressure and temperature must match precisely for a diamond to grow. Only then do carbon atoms close tedrahedral to become a precious diamond. Depending on the carat weight, the transformation process takes between eight to fourteen days. Accuracy, tact and discretion are our priority. We log each work step precisely and document these very thoroughly. About 150-300 grams of ash are necessary for a one carat diamond, thus the entirety of the ashes of the deceased are not required. The remainder of ashes which is not used for the diamond is generally placed, as usual, in an urn. Would you like to have a memorial diamond made of the ashes of a loved one as an eternal remembrance? We are your specialist in cremation diamonds.